THE FIRST WEEKEND in March was once again a busy one as over 600 people flocked to Warrandyte Reserve for the eighth iteration of the community running event to either run or volunteer. A little rain overnight kept the morning temperatures down which was a welcome relief to most who would have been training in the weeks leading up to the run where average temperatures were around the high 20s–low 30s. This year, the run organisers managed to negotiate a tweak to the existing courses which made the run both easier to manage and a more challenging run. For the 2.2K runners, this meant they only had to run one lap, instead of two as in previous years but saw them climbing all the way up Everard Drive and Pound Road, alongside the 5, 10 and 15K runners. For the longer distances the course still looped through the Pound but thanks to the cooperation of Parks Victoria and property owner Jan Day, runners passed through her property after exiting the Tank Track and joined the bushland trail which follows the river between the Ranger Station and the Tunnel carpark. Despite what was viewed by the run committee as a more trail-like and technically challenging course, and the fact that each lap of the longer runs were around 150 metres longer than five kilometres, the feedback on the finish line and around the event village was extremely positive. David Dyason, chair of the Run Warrandyte committee spoke to the Diary about the success of the event. “This year’s course was highly acclaimed by all participants, we have received many compliments and no negative feedback… one participant made us promise not to change the course next year ‘it was so good…’ which we have had to do for various reasons in the past,” he said. Warrandytian Brynton Ashton placed in the top three of the 15K distance since it was introduced in 2016. Brynton once again dominated the longer distance finishing 1:25 ahead of 2nd place Alex Tracey and despite the tougher course, only 29 seconds slower than the previous year. After the race, Brynton spoke with guest commentator and Member for Warrandyte, Ryan Smith. When asked how he was feeling Brynton said his legs were “a bit sore given the new course” but that it was overall an enjoyable run. The buzz around the event village after the run was great with numerous medal ceremonies taking place, Run Warrandyte also had a number of runners running for charitable causes, both local and afar. The event’s official fund raising page gave participants the opportunity to raise money for organisations including the Warrandyte Netball Club, Warrandyte Football Club, Warrandyte Junior Football Club, Warrandyte Cricket Club, Warrandyte CFA, STOP One Punch Can Kill, and Rivers Gift(SIDS). Through the event, runners managed to raise over $2700, cementing Run Warrandyte as a great platform to inspire people to raise money for a good cause. Mr Dyason went on to talk about the unique opportunity a fun run in Warrandyte presents and praised Parks Victoria for their assistance in making the course run a possibility. “We think that, for a fun run, our course is truly unique. “The mix of urban streets, fire trails and State Park single trails, with much of it having Yarra River views we think it’s an awesome treat. If you ran on the day, make sure you visit the event page on GeoSnapShot for official race photographs. Run Warrandyte will be back in 2019. Medals were awarded for 1st, 2nd and 3rd in an Under 8, 12-17 and Open categories for most distances, medal winning runners and their official times are listed below. Spelling of names and official times sourced from Tomato Timing. 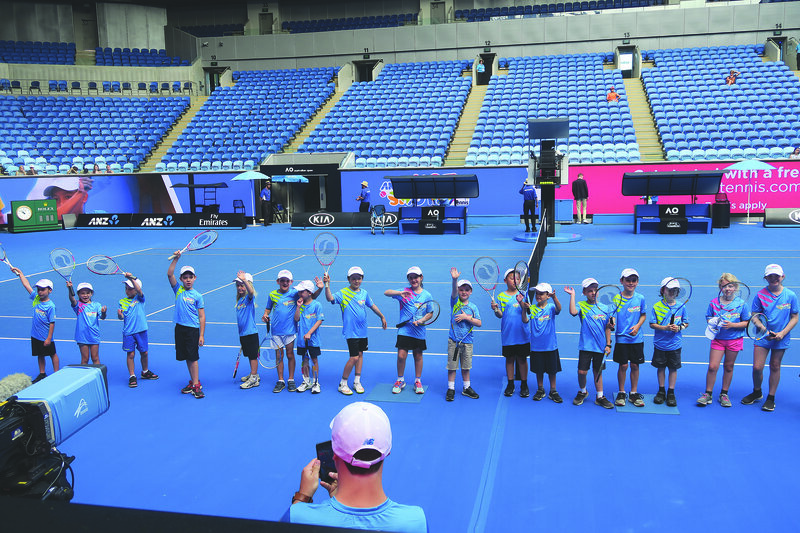 WARRANDYTE Tennis Club coach Joel Compagnino has been kept on his toes during his third year of co-ordinating the ball-boys and girls at the Australian Open, managing over 350 children as the Grand Slam rolls into Melbourne for its 2018 edition. 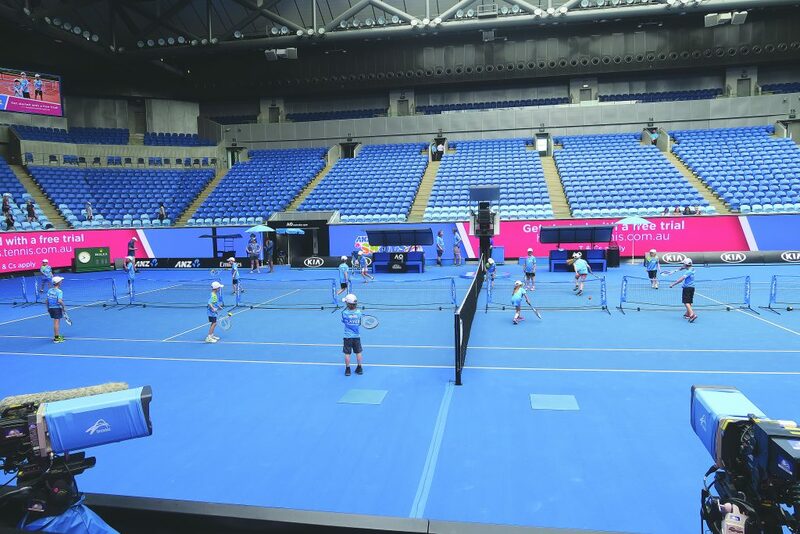 Joel, who was a ball-boy himself at the 2001 Australian Open, has a total of six years’ experience under his belt working in different roles around the event prior to settling on his current task of assisting in the management of the ball-kids. “It’s been a lot of fun,” says Joel. “During the tournament, it’s all about marking them, making sure they stay hydrated and generally supervising them through the event. “It involves getting on to the court and watching them in action day to day. “It’s good to be involved with the kids, especially the ones that you know from coaching. “It’s always good seeing them make friends as well,” Joel told the Diary. It’s a busy time for the Warrandyte Coach, but he says working with others in the fifty-person management team who are as passionate about tennis and developing the youth of the green-ball game is a plus. “It’s a really good atmosphere,” he says. “We’re pretty like-minded and do the same things so it’s good to catch up every year. 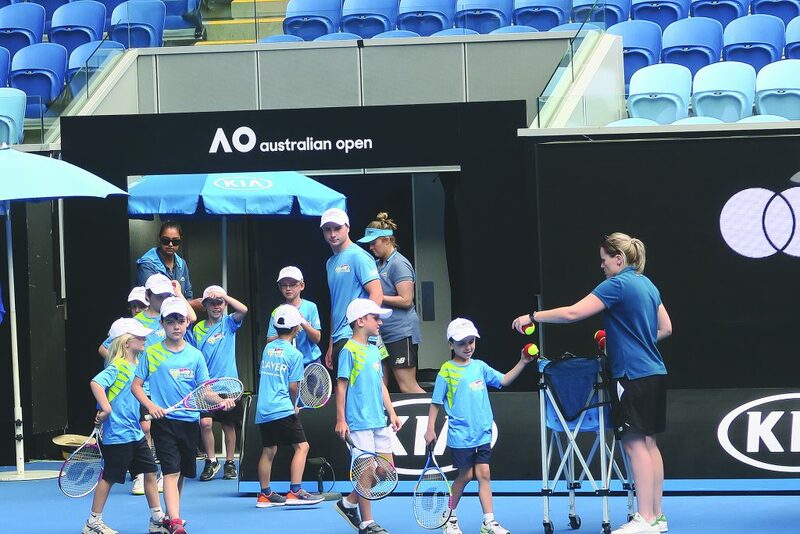 For the ball-boys and girls that participate, the Australian Open will provide memories that last a lifetime and the chance to work with the greats of the game and witness their prowess firsthand is a highlight that won’t soon be forgotten. “They definitely enjoy the experience,” says Joel. “They like to rub shoulders with their idols, even just to be involved with the inner-sanctum of the tournament and to see a little of what the public doesn’t see as well as seeing their heroes walk down the corridors. As well as being involved with the kids during the tournament, Joel has a significant role in assessing the ball-kids for the next tournament and he says the criteria to qualify for a spot can be tough, but there’s always a sure-fire place to start. “Firstly, they’ve got to know a little bit about tennis,” he joked. “They’ve got to know how to score the game so they know which end the balls need to go. The trial period, which occurs in March, is a hectic time for Joel and the other coaches as they attempt to grade 2000 prospects. There is significant competition for spots as young tennis players from around the area and interstate, and in some cases overseas, vie for a spot amongst the 350 chosen during the June-July selection period. 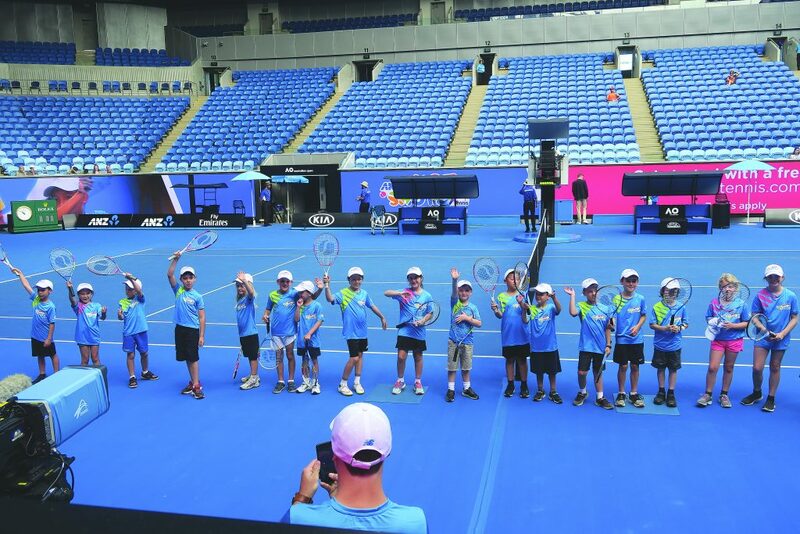 In the meantime, however, Joel remains the “king of the kids”, overseeing the current generation of the Australian Open ball-boys and ball-girls. 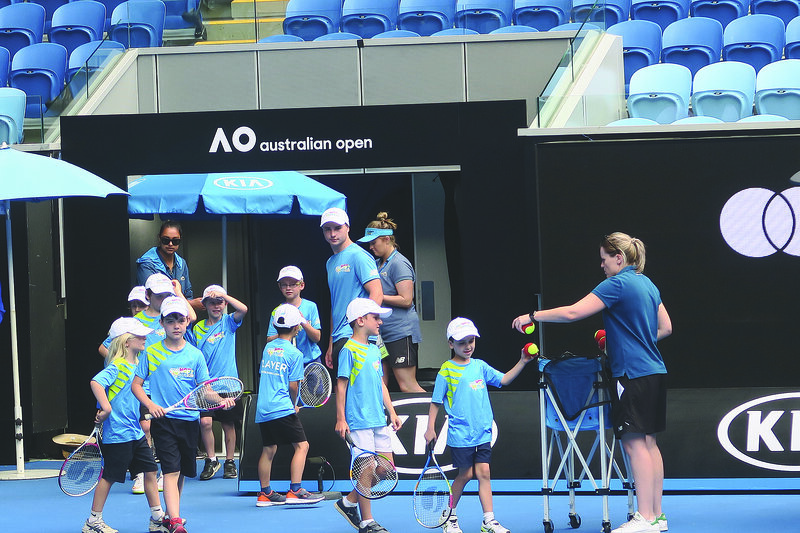 Once again the Tennis Guru provided a once in a lifetime experience to 40 kids from the Hot Shots tennis programs at Warrandyte Tennis Club (WTC), Warrandyte Primary School and Milgate Primary School. The kids were demonstrating their amazing tennis skills to the adoring fans (and of course their parents). 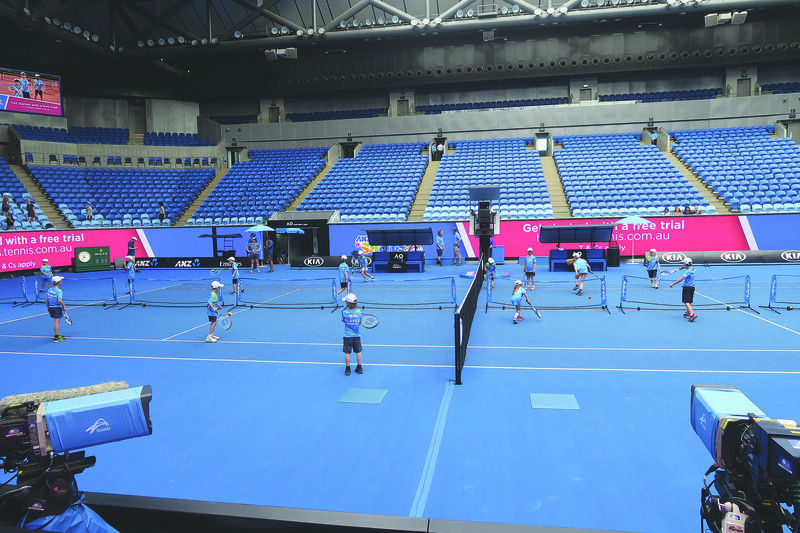 The 30 minute demonstration opens up play on the stadiums and the kids are followed on court by the professionals for their Australian Open matches. Coaches Matt Neil & Angus McLellan represented WTC and helped the kids and parents throughout the morning. Charlotte Petrella tossed the coin for Dylan Alcott’s match and Max Brogan tossed the coin for the legends featuring Henri Leconte. The rest of the kids got to make a guard of honour so they could high-five the players as they came on court. We also had five WTC Hot Shots competing in the inaugural Orange Ball and Green Ball challenge on Australia Day at the Australian Open. The teams competed against other clubs from around Melbourne on the courts the pros play on. Certainly some amazing tennis action for the kids from WTC. Every year, members of the Over 60s Warrandyte cricket team volunteer their time at the two local primary schools to teach students some batting, bowling and fielding skills. This year, Steve Pascoe, Barry Johnson, John Smith, Norm Darnfield and Ray Baird coached students in the Foundation, Grade 1 and Grade 2 classes at Warrandyte Primary School with a series of Milo cricket drills. “The veteran cricketers are really entertaining and very enthusiastic about their sport,” said PE teacher Sally Freemantle. “The students always love it when they visit — it’s a very popular event at school every year,” she said. Steve Pascoe has been involved as a player at Warrandyte Cricket Club since 1976. 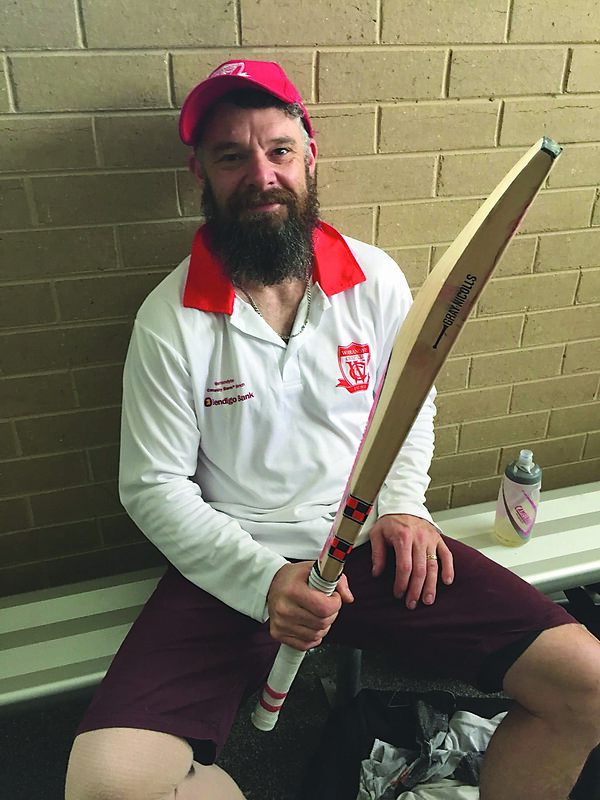 He and his team of veterans also run the Milo cricket program at the club, and they’re always on the lookout for new recruits during their school visits. “Milo Cricket is a great initiative,” Ms. Freemantle added. “It’s a terrific opportunity for children to learn basic ball skills and it’s a gentle introduction to a team sport. “Getting children involved in sports, especially team sports, is so important. “There are some very important life skills to be learnt by being part of a sporting team, as well as the health and fitness benefits,” she said. This year the Milo IN2CRICKET program begins at WCC on Friday November 3 at 6pm and is open to boys and girls aged 5–8. Sessions run for up to an hour, using plastic bats and rubber balls. The program is also designed to be inclusive of children with disabilities. It runs every week through until March, except for the Christmas break. WARRANDYTE Venom’s Youth League One Women’s team crowned a terrific season in early September, winning the Grand Final over three thrilling games. The Venom women defeated Coburg by five points at the Warrandyte Sports Complex in game three to take home the flag, giving co-captains Casey Taylor and Ellie Lock a fitting send off in their final games for the side. 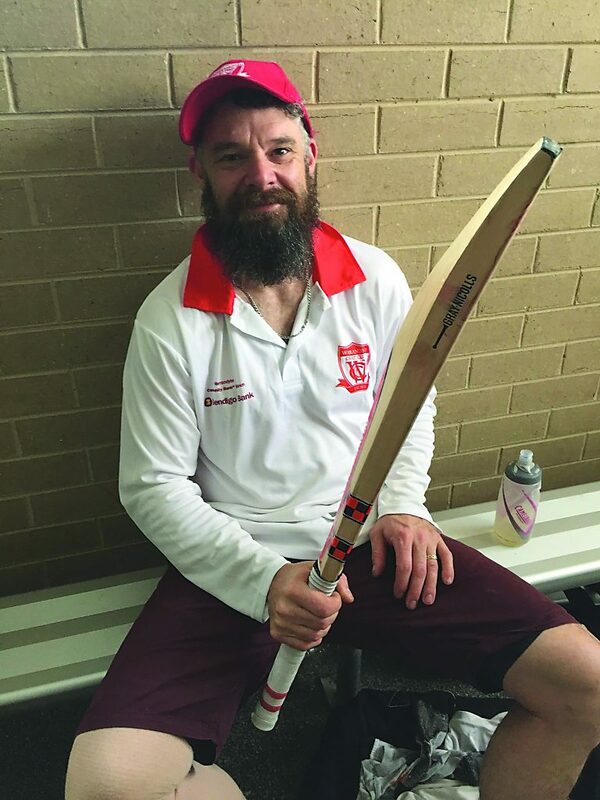 Warrandyte went into the finals series on top of the ladder, after dropping just two games for the season, and had a week off heading into the Grand Final series, played as a best of three. However, the week off may have done Warrandyte a disservice according to young gun Maddi Taylor, as Coburg were able to seize their chance, defeating them by 11 points. “We’d beaten Coburg quite easily in both games during the season, and because we went straight to the grand final we had a week off. “They didn’t, so they had a bit of momentum heading into that first finals game, and that caught us off guard a bit,” Taylor said. In game two, Venom were a different force, and squared the ledger at 1–1 after a nine point win. Ellie Locke led the way with 22 points and six assists, aided by Maddi Taylor who scored 18 points, and Simone Caruana, who notched 13 points and grabbed 14 rebounds. In the all-important deciding game, Warrandyte were too strong throughout the contest, surviving a final quarter scare to run out deserving 78–73 winners. “We had the lead the whole game and we played really well, in the last quarter they came back a little bit, but we kept our composure and sealed the win in the end. “I think Coburg actually finished fourth so they did really well to come out and have a crack like they did,” Taylor said. Locke, Taylor and Caruana were again influential, along with Isabel Feller. Locke threatened to triple double with ten points, seven assists and six rebounds, while Caruana continued her form on the glass, with 14 points and eight more boards. Taylor and Feller took it upon themselves to carry the scoring load, dropping 17 points each to bolster the offence. Spearheaded by coach Angela Heigh, Warrandyte’s achievement and ultimate success owes a lot to hard work and a lengthy pre-season. “Our pre-season started in October last year to try and prepare. “We did a lot of training, won a pre-season tournament and it’s been a good season just from there,” Taylor said. No season is complete without an awards night, and Warrandyte were the toast of the town on September 23, at the Big V Awards ceremony at Etihad Stadium. Simone Caruana and Ellie Locke received a prestigious all-star starting five position, while Caruana was also crowned the league’s best defensive player. All of the Venom players were invited on stage to accept the trophy, capping off a terrific campaign. Preparation now begins for participation in the State Championship Women’s league, after promotion was earned in the 2017 season, while Warrandyte Basketball will hold their AGM on October 31.